The other evening, I made a Sweet Potato and Poblano Pepper Soup, infused with virgin coconut oil, shallots and seasoned with just a hint of smoked paprika and cumin. It’s a favorite of ours now, though its potent heat needs balancing by good-sized spoonful of sour cream. My little boy likes it too, gobbling it up and asking for second and third bowls. It’s hot and sweet, and deeply pleasant. And now that the days have turned bitterly cold as we await the warm breath of spring, I turn to soups like this one – soups that are twice hot: once in temperature, and again with spice. I start the soup by gently frying thinly sliced shallot and poblano peppers in a bit of coconut oil, before dropping in the sweet potatoes. You see, yellow and orange vegetables love coconut oil. Their natural sweetness benefits from the powdery, floral and very faintly exotic flavor of coconut oil. And, like all good things, when eaten together they complement each other, benefiting you more than if you ate them in isolation. Beta carotene is fat-soluble; that is, in order for your body to reap the benefits of this antioxidant, you’d do better to consume it with fat. Coconut oil, with its high content of lauric acid – an immune-supporting saturated fat that also increases HDL cholesterol – is a natural fit. Lauric acid, abundant in coconut oil, can be otherwise difficult to find. Palm kernel oil contains a small amount as does human, cow and goat’s milk. While I tend to favor animal fats in cooking – ghee, butter, lard and bacon fat – because they’re easily had locally, I make an exception and buy a small amount of coconut oil each year for special dishes like this one, and to make sure we can enjoy all that lauric acid. I favor extra virgin coconut oil. I like its mild, faintly sweet and very slightly coconut-like flavor, the clean way it melts and how it pairs with not only sweet potatoes, but also butternut squash and South Asian-inspired dishes. You can find unrefined extra virgin coconut oil in most well-stocked health food stores, but I typically purchase it online (see sources). Melt the coconut oil in a heavy-bottomed stock pot (like this one) over medium heat. Stir in the shallot, and fry gently until it softens and releases its fragrance. Stir in the poblano pepper, and fry until softened - about 4 minutes. Add the sweet potatoes to the pot along with cumin, smoked paprika and sea salt. Cover the pot and sweat the potatoes until they soften - about 10 minutes. Pour in the chicken stock, and simmer, covered, for 30 minutes or until the potatoes fall apart when pierced with a fork. Turn off the heat, and puree the soup with an immersion blender (you can get one here), until the soup is smooth and uniform. 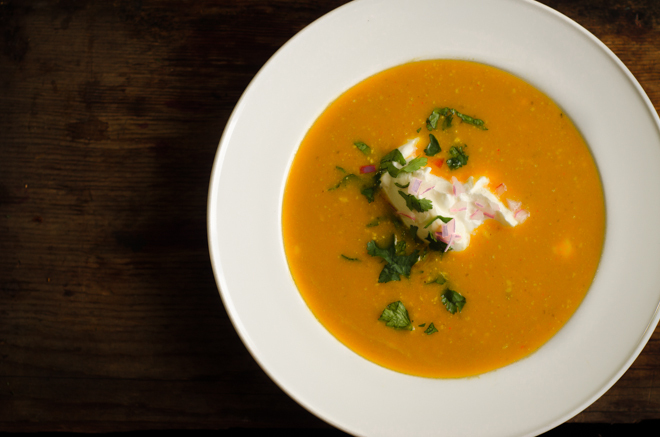 Ladle into soup bowls, and serve topped with sour cream, red onion and cilantro as you like it. This sounds heavenly Jenny. Since we aren’t eating any kind of potatoes right now, I’m going to try it with butternut squash. I’ll let you know how it turns out! I’m confident it would do well with butternut squash, but do let us know if you try it! 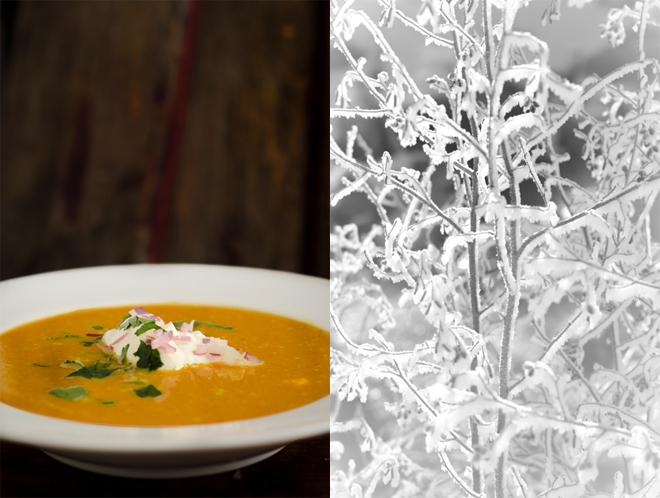 We had this soup tonight with Butternut squash instead of the sweet potatoes…. yum! Thank you for another awesome recipe Jenny. I am not sure if I will be able to find Poblano peppers in my stores. Any good substitutes? Poblano are not that spicy are they? I do not mind little spicy but some peppers overwhelm a dish to an extent that I cannot taste anything else then it is too much for me. Pablanos are also called Pasilla Peppers. My daughter said the same thing, she couldn’t find pablano peppers!! Jenny this sounds amazing! Are the poblanos fresh or dried? I don’t recall seeing them fresh in my grocery stores. So I’m curious before I head out on a hunt for the wrong thing. Haha! Thanks! I use them fresh – you might be able to substitute 1 jalapeno, though. I get poblanos in my farm share in the late summer/fall. I think, since they are sautéed, that I could freeze them and toss the frozen peppers in with the shallots. The texture difference wouldn’t be apparent especially after blending. We freeze most of our peppers from our garden, and I freeze extra from farmer’s market when they are in season. I freeze them whole, or just deseeded. When I’m using them in soup (which is every week, SO likexs tortilla soup for lunch) I just pull some out of the freezer, chop up partially frozen, and put in the soup. Works fine for us! We use coconut oil for just about everything. In the frying pan for our green farm eggs in the morning, on the toast, on all of our garden vegetables with Liquid Aminos. We grow sweet meat squash, but the coconut oil will go with any squash, which certainly could be substituted for the sweet potatoes. A good source for coconut oil and other coconut products, plus hemp products is NUTIVA,com. If you sign up for their newsletter, every Tuesday there is a weekly special, which includes several items at a wonderful discount and also free shipping. The coconut oil comes in several sizes and even a gallon bucket, which we now get when it’s on the special. Thank you, Jenny, for explaining why sweet potatoes and yellow and orange vegetables in general love coconut oil. This soup looks/sounds delicious. BTW for those having a difficult time finding poblano peppers, they are usually mislabeled in stores North of the Rio Grande as pasilla peppers. Hello dear Janice, in Mexico the poblano pepper in its dried state its called chile ancho, and pasilla pepper in its fresh state its called chilaca. Just a little fyi. Cheers! I did not have the peppers and used a dash of cayenne. It was so creamy and delicious! This is by far my favorite sweet potato soup that I have ever made. Thanks for the recipe! This soup is delicious! I made it last night using red onion in lieu of shallots because I had them on hand. I know I’ll be making this often…thanks, Jenny! Thanks much for a wonderful recipe! I made it today with one slight modification – I added a bit of coconut milk to compensate for my error in letting some of the “goods” brown on the bottom of the pot (heat initially set too high, I imagine). I was afraid the accidental browning was going to impart a bitter taste and I thought the coconut milk would help. It did! I now look forward to making it again (this time cooking at the proper temperature) since my version still tasted great! Thanks again! Oh! I did the same thing and I’ve got coconut milk, so I’ll do what you did. I took it up a notch and roasted the poblanos overa medium-low flame on my gas range. Once they’re blackened on the outside, I immediately put them in a covered container to let them steam for about 10 minutes. Then I peel them, then use them as directed. This step adds an extra smokiness to the soup. Yummy! This is good soup. The poblanos available in the supermarkets here are mild, so I threw in 1/2 of a jalapeno and some cayenne. I also added 1/3 C of heavy whipping cream. It’s a bit too salty after an hour of sitting, but we’ll see what happens over time. I might also throw in some coconut milk for added richness and fat. Thanks for the recipe. This soup looks fantastic! I recently discovered smoked paprika… it adds so much unique flavor. I buy a jar of coconut oil every six months, to keep it fresh. Whatever is leftover in the old jar we use as a skin moisturizer. I’ve heard that a small amount of those beneficial lauric acids can be absorbed through the skin. Made this soup the other night- delicious! Mine didn’t come out as vivid orange-yellow as pictured, more of a khaki color, but not a big deal! Every vegetable recipe ( creamed collards, cultured veggies, sauerkraut) I’ve made from the NK site has been a hit! This is great! My wife (a nutritionist and medical journalist) had discovered the health benefits of coconut oil while researching for a paper. Of course I picked some up and we have been enjoying the nutty flavor finding new ways to use it with a healthy appetite. When I read the title to this recipe I could imagine the flavors dancing on my tongue! This sounds so perfect. What a great collection of complimenting flavors. Mmmmmmmm! A big hit! Thank you! Sourdough corn bread and sausage for the boys who needed something to go with it. Delish! I used my garden frozen bell peppers and threw in a small red potato for texture. It was still out of this world. Loved it!!! Now of of my top 10 soups. Great soup, really love it, thanks! I had never heard of poblano peppers but the image on Wiki looked very much like the ones I am growing so I threw two in. Outcome was delicious so maybe the peppers I am growing are poplano after all. Oh Jenny this is so lovely. This is been on my “to do” recipe list for ages, but just this week I had exactly 2 poblanos and 3 small sweet potatoes left over from other dishes. I went with stock from a pastured nitrate free smoked ham bone because it is what I had on hand….and since I already had that smoky flavor I used regular paprika instead of smoked. Just so lovely and such a nice transition from end of summer into fall here in the east. I made this today with the addition of a healthy pinch of cayenne cup of leftover butternut squash cubes. Very pleased with the result….velvety, warm and spicy! YUM, tested a cup just now, the rest is simmering. This is just awesome. I used Hot Smoked Paprika – and it’s just right with a dollop of greek yogurt. Hoping the grandkids will love it too for dinner tonight! It’s a good size pot, so I may throw in some garbanzos after a couple days to change it up. I did add some turmeric too, since we’re trying to get it in however we can. Thanks so much for a wonderful soup! My husband says it’s a hit! We didn’t have any Poblano so I substituted Ancho Chile and Jalepeno peppers. It was warm, hearty, and delicious paired with crusty homemade bread and a little cheese. I just finished making the soup and blending it and it is the consistency of broth. I expected it to be thick. It calls for 2 medium sweet potatoes. Do you know the appoximate total weight of the sweet potatoes. I thought mine were medium and actually used 3. Is the 2 quarts of broth accurate?